Michele Mishler created some quick and easy baby items for her feature project in Janome Digest Issue #26, "Conquer Closet Chaos." This receiving blanket is double fabric, making it just the right weight – from changing diapers to covering baby for a nap. 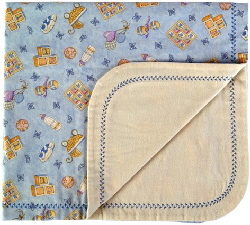 It's sure to become a favorite “blankie” for any baby! This project is specific to a particular brand of sewing machine, notion, fabric and/or supply. However, the project may be easily adapted to other brands. 1. Cut a 27” x 30” rectangle from each piece of flannel. 2. Round the corners of each piece. 3. Set up the machine for ordinary sewing. 4. Place the rectangles of flannel right sides together, matching the edges. 5. Stitch together with a 1/4” seam, leaving an 8” opening. 6. Turn the blanket right sides out, and press. 7. Hand stitch the opening closed. 8. Set up the machine for Decorative stitching. 9. Thread the needle and bobbin with Janome Embroidery thread. 10. Attach the Satin Stitch foot F.
11. Select a decorative stitch, and sew around the blanket 1” from the edge. Tip: You can use the leftover fabric to make a matching “burp cloth” following the same steps used to create the receiving blanket. Cut the fabric 10” x 24” and finish to match the receiving blanket.